This is a great mild small cigar! Always consistent excellent construction, easy draw & wonderful mild flavor. Light but with very nice flavor. Perfect small cigar for winter, when you don't want to be out in the cold for too long. No matter what your inclination is at the moment, La Unica always pulls through with a satisfying flavor that never fails and keeps me coming back for more. So I always keep two bundles around to be safe, especially when my humidor is low on high end smokes. These will more than do it! old established brand that hard to beat. I've been smoking these cigars for over thirty years. Always consistent and a real pleasure to smoke. Awesome cigar, burns even, fine finish. My biggest concern was the sticks would be dry when I got them. I smoked one and it was ok.
Somed these consistently in the late '80s/early '90s and then forgot about them as I explored other options. Thought that these weren't available. Pleasant surprise. Great traveling size smoke. I love these cigars because they are the perfect size and width for my everyday smoke. They are smooth and have an easy draw which makes it one of my best low cost per stick cigars in my humidore! 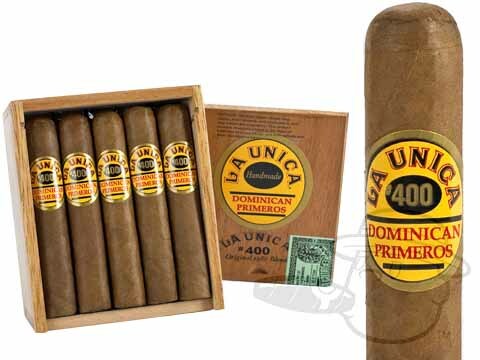 La Unica #400 Natural is rated 4.7 out of 5 based on 14 customer ratings.